In the eastern portion of Guangzhou’s Tianhe District lies the neighborhood of Huangcun, home to the colossal Guangdong Olympic Stadium. The name is a tad deceiving, as the massive sporting structure has never held the esteemed Olympic Games. Instead, it was erected in 2001 for the 9th National Games of China, held soon after Beijing won the bid to host the 2008 Summer Olympic Games, hence the ‘Olympic’ moniker. Two years later, the stadium was the main venue for the 2010 Asian Games. 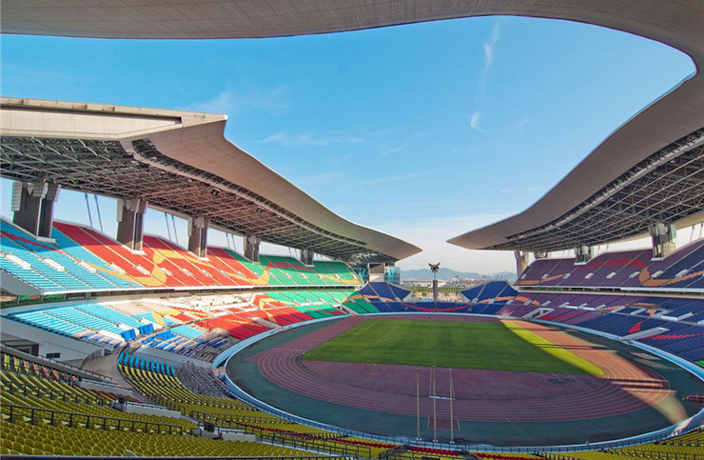 Today, Guangdong Olympic Stadium remains the largest stadium in China in terms of seating capacity (80,012 seats) and is mainly used for football matches (soccer, for all you North Americans). The area surrounding the modern-day mega-coliseum is home to an array of China’s finest sports facilities, including world-class swimming pools, an equestrian training center and tennis courts that resemble a Hakka walled village, among others. Be that as it may, the impressive structure has hosted few important football matches in recent years, largely due to its remote location outside of Guangzhou’s city center. While many newcomers to the city are unaware of the existence of Guangdong Olympic Stadium, even longtime residents of Guangzhou are likely ignorant to what formerly occupied the land that the stadium now stands upon: Huangcun Airport, built by occupying Japanese forces in 1940. The now defunct and dismantled airport was completed two years after the Japanese army began their occupation of Canton, and was used as a distraction from their main air force base in Guangzhou: Tianhe Airport. (In a strange twist, the former site of Tianhe Airport is now occupied by Tianhe Stadium). Mock warplanes made from wood and iron were parked at Huangcun Airport in a bid to trick Allied bombers. The only indication of Huangcun Airport’s existence that still remains today is a blockhouse overgrown with foliage a short stroll from Guangdong Olympic Stadium. See listing for Guangdong Olympic Stadium. For more Behind the Concrete(s), click here. A look back at the biggest Chinese sports moments of 2016. The pro athletes, academics and tournament organizers of China's massive esports industry.